Today's cutting edge smart technology continues to make driving more convenient and safe, and Chevrolet is a leader of this trend. The new Colorado showcases the most effective technologies that help prevent accidents on congested city roadways. 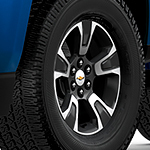 The Chevy Colorado's safety technology package includes Front Pedestrian Braking and Forward Automatic Braking, which together ensure than your vehicle stops when a collision becomes imminent. It does this by monitoring in real-time the distance between the Colorado and solid obstacles using built in sensors. Cameras combine with smart technology to make cruise control adaptive to stop-and-go traffic. The system measures and responds to the speed of traffic, reducing the stress of constantly reacting to changing road conditions. The Chevrolet Colorado is also equipped with Rear Vision Camera technology, which gives the driver a view of what's directly behind the vehicle when backing up.